Go online and pay your bill easily and securely with SmartHub. With SmartHub, you can log in and pay your bill over the Internet from a browser. Paying your bill online saves your co-op thousands of dollars every year, and saves the planet, too. Fewer bills equals less paper. Use SmartHub to your energy usage and manage your payment. Worried about how you’re doing during the month? Log into SmartHub, click My Usage, and check. Generally the data is uploaded within 24 hours of recording. 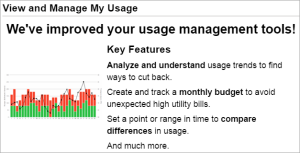 You can analyze your usage, and do an easy usage comparison with the online tools. Curious about your Average billing? You can see a report that reports the average temperature and your usage for each month in the period you choose. Try it today. Call us at 360-376-3500 if you need help logging in to your SmartHub account .